She has written for many local, national and international magazines on a myriad of topics. Many of her books and articles have won and been nominated over the years for special awards by the DWAA. Pam started her own business, Positive Dogs, in 1996. 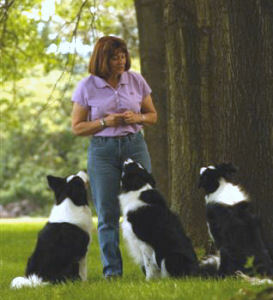 Since then she has helped thousands of dogs and handlers build their relationships and solve problems, by teaching basic obedience through competition and working with a myriad of behavioral problems. Pam teaches puppy K, basic obedience through the Canine Good Citizen test, competition obedience, Rally-O and holds regular classes and seminars for aggressive dogs. You Can Train Your Dog: Mastering the Art & Science of Modern Dog Training , Shadow Publishing WINNER of a Maxwell Award for Best Training Book! She speaks on a myriad of topics, including positive training, competition, shaping, Rally obedience and aggression (R.E.W.A.R.D. Zone) across the country and abroad. She and her Sheltie Cody qualified and competed in the Eastern United States Dog Obedience Championships held in Bethlehem, PA in 1996. Cody was also in a Milkbone print ad. Beau and Pam were in the movie, I am Legend. Pam competes successfully with all of her dogs in competition obedience and Rally (to date: 10 CD titles, six CDX, three UD’s, three ARCH’s, three ARCHX’s, two ARCHEX’s, three R1MCL, one RL1, one R2MCL and one R2CL, two RL3, with almost every leg in both sports being a placement), and agility, (o date: one NJC, two NAJ and two NA, all first placements) plus seven CGC certificates, one TDI and three TSW’s (Canine Water Sports) and she continues to train for competition obedience, treibball, and tracking.